I try to get the most out of my wardrobe by wearing summer pieces year-round and making things work as both office wear and stay at home mum style. There are a few pieces I keep strictly for work wear though. Both printed tops I'm wearing below were packed away when I outgrew them in pregnancy and left aside while I was on maternity leave. It's been good to unbox them again now I'm back in the office! Printed tops pair so nicely with black pencil skirts. While I'd been going without tights in the mornings, the not quite spring weather didn't hang around long so it was a bit chilly this morning, back to tights and ankle boots. Despite it being a very cold morning, I still wanted a cheerful and colourful outfit. With the navy polka dot top and the purple bag, the outfit was already colourful, but I thought I'd add the yellow statement necklace for a finishing touch. I really liked this outfit combination. Nothing like a bit of colour to cheer you up on a cold morning! Last worn: navy macintosh, polka dot ruffle top, black zip detail pencil skirt, black ankle boots, purple Balenciaga work bag. Other ways to wear: navy macintosh and chambray dress, polka dot ruffle top and red jeans, black zip detail pencil skirt over a dress, ankle boots and little black dress, purple Balenciaga work bag and textured pencil skirt. Perfect for pregnancy: ruffle top hiding an early baby bump, pencil skirt in first trimester, ankle boots in second trimester. I always have a hard time remembering the differences between these two black pencil skirts when I write blog posts! The one above has an exposed zipper detail on the back, and this one here has elastic panels displayed at the waist but it's hidden under the trench coat. Despite these minor differences they do look identical - but with so many printed tops in my wardrobe a couple of black pencil skirts are a necessity for easy office outfits. This dachshund print top was an impulse Target buy a few years ago. It didn't get worn an awful lot when I first got it as I found the stitched on waist belt a bit limiting with how I could wear it. A comment from Sheila on her blog about how she removed a similar belt gave me the idea to take the belt off. Removing the stitching and the belt was my first ever DIY attempt with a top, and I love how it makes this top a lot more wearable. 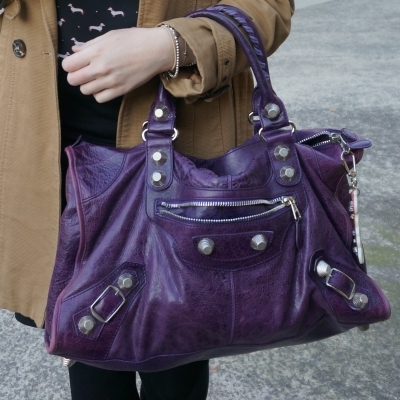 The purple in the print made this purple Balenciaga work bag an easy accessory to pair with it! 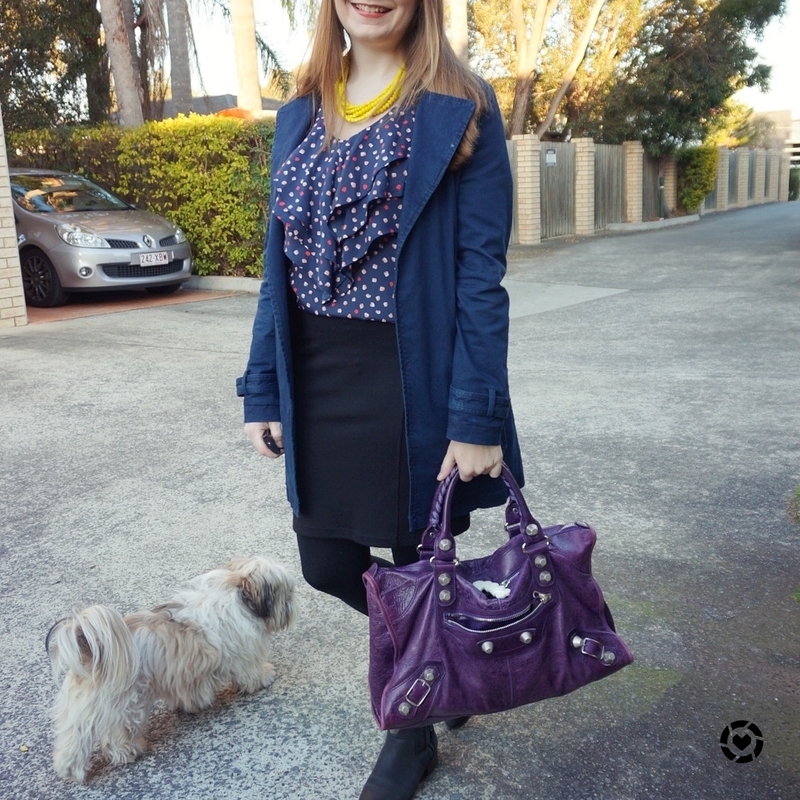 Last worn: camel trench, dachshund print top, ponte pencil skirt, camel ballet flats, Balenciaga purple work bag (above). Other ways to wear: camel trench and skinny jeans, dachshund print top and red jeans, ponte pencil skirt in summer, camel ballet flats and skinny jeans, Balenciaga purple work bag and blue dress. Perfect for pregnancy: camel trench in the first trimester, dachshund print top hiding a second trimester bump, ballet flats in third trimester. A black pencil skirt is an easy base for an office outfit. You can add some colour and fun with a printed top, and go a step further with colourful statement accessories too like in the first outfit. Not all printed outfits need to be overly colourful, sometimes keeping things simple and picking one colour from the print to wear in your accessories too works as well like in the second outfit. A black pencil skirt is one of those must-have pieces in your office wardrobe. 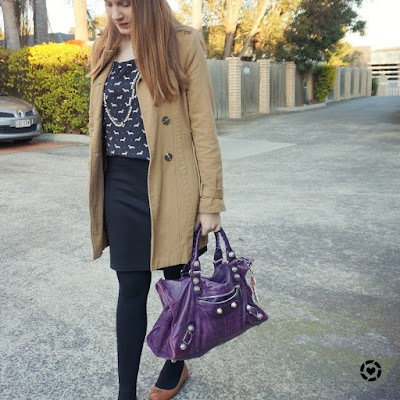 Linking up with Confident Twosday, Turning Heads, On Trend, Style Sessions, What I Wore. I only have one pencil skirt, an it is pretty colorful, I guess I need a black version as well. LOVE the pop of yellow with the blue! Soooo pretty! These blouses look so lovely and perfect for work. You look lovely! I love being able to get out my tops I cannot wear with Ivy when I head to the office. There is just something about it that makes you feel put together right? You look lovely! haha yeah, it really is, you feel more pulled together in work clothes! It's nice to have some things that are reserved specifically for the office isn't it, makes you feel that little more polished when you wear them! It really does, makes you feel more dressed up! They're both so cute! And I love the pop of purple with the bag. Woohoo for DIY-ing that second top too! Love when one little change makes me wear something more. Loving the blue tones and then the pop of yellow, looking so chic! Hi! Beautiful as always! The bag compliment your looks perfectly!I also like wearing my items season to season. Have a great week! What beautiful pairings! I love the way the grape purse looks with the navy in the first outfit and the camel colored coat in the second, so pretty! Thanks for sharing and I hope you have the best week ahead! Nice looks, I love both coat and I'm obsessed with the Balenciaga color! 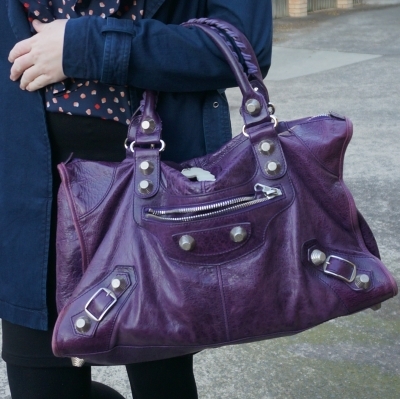 I remember I had a purple bag a few years back that I absolutely adored. And I love yours just as much. It adds such a nice touch of color to your outfits! I like both looks ! In my case with the exception of long gowns I have no rules for wearing garments: they 're worn whenever needed. Looks like it got chilly! I'd love to have a wardrobe like that I can wear for any occasion! I'm working towards it! I love how you styled the blouse. Love these professional looks! A pencil skirt is the perfect piece to bridge work and fashion! i love your outfits...they are all so darling! Love that you were able to remove the belt from the dog print top to make it more wearable, because it's so cute and deserves to be shown off! I like the pairing of the first top with the bag. Looks great. Your camel coat reminds me that I need to snag one in preparation for Winter. You have an awesomely blog -- I'm following ;) and I would love if you could follow me too!! Love the both looks! Pretty! That second look is so great! Such a classic with the trench coat! So chic here, lady! Love this look! I love the dachshund print top much more without the belt! It makes it a more versatile piece! I have done that before with tops to extend the life of them. It's a great idea! I'm glad I did it so I can wear this more often! Those printed tops are so cute! Oh how smart to take off the belt to make that top more wearable! I never really think to modify my clothes like that, but I should. Also, how pretty is that ruffled top in your first look? I absolutely love that! I'm glad I gave it a go, it made the top so much more wearable! What a great look for work! You look so classy and polished! I love that you made a pencil skirt work for fall by wearing tights. What a great idea! Have a great week! Love both the looks sweety! I always feel super crafty if I can alter something without having to go to Mum or mum in law, hahaha, needless to say it extends to snipping off belt ties and that's about it. Yup that's the extent of my skills too! Mica, that daschund top was an excellent purchase. I love black & camel together. Always looks so good. I love the dots and ruffles in the other top! Very pretty. Love both outfits.